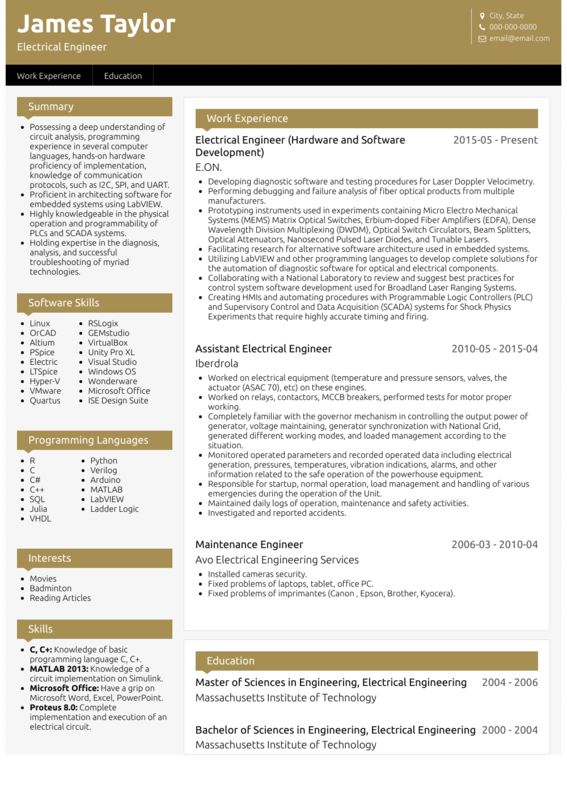 This page provides you with Electrical Engineer resume samples that you can use for inspiration in writing your own resume, or for creating one through our easy-to-use resume builder. Below you'll find our how-to section that will guide you through each section of a Electrical engineer resume. There’s no doubting that the field of electrical engineering is on the up - but with this high growth, and the salaries and benefits that follow, comes an abundance of highly qualified candidates all applying for the same jobs. Our professionally designed electrical engineering resume samples will help you stand head and shoulders above the competition, commanding your future employer’s attention. VisualCV has helped over 3 million prospective professionals achieve their career potential, so now is the time to get inspired and build your dream career. With the average time spent looking at a resume lasting approximately 6 seconds, it’s essential to make that time count. Follow the sleek and professional reverse-chronological resume format to highlight your biggest wins and achievements in the electrical industry, straight from the get-go. Use big, clear headings and a clean font type like Arial when constructing your resume. Exporting your electrical engineer resume in PDF rather than Microsoft Word will ensure that it looks clean and intact when being viewed by other professionals. Consider this section as your elevator pitch to prospective employers. It gives you the opportunity to convince them to read on, instead of throwing your resume in the slosh pile with the rest, bidding farewell to your electrical engineering career. If you are a highly experienced electrical engineer with years of experience in technical-management, testability analysis, communication systems and circuitry, make sure you highlight this as soon as possible. Senior electrical engineer with 15+ years of experience and attention to detail. Deal proficiently in communication and mechanical systems on commercial and industrial levels. Proven success in upgrading old X system to C++, cutting testing time in half. Desire to bolster knowledge and experience in systems, technical-management and circuitry to maximise productivity. Electrical engineer seeking big company. Skills in systems and management. Can work solo or in a team. No access to car but can travel if necessary. With our resume builder you will get tips and examples to inspire you to build the best electrical engineering resume. If you’re an electrical engineer with less experience, or happen to just be starting out in the industry, we highly recommend using a resume objective to show your enthusiasm for the job, and to cover your lack of experience. Enthusiastic and professional entry-level electrical engineer. Designed and drafted electrical systems for three-storey apartment complex on university placement. Consulted with local fire department on efficient energy systems. Junior electrical engineer seeking entry-level position. No experience in the professional world but am eager to learn. I possess great interpersonal skills and a growing knowledge of the industry. Our resume builder (LINK) will give you tips and examples on how to write your resume summary or any other section. You can easily copy them straight into your resume - it will save you a ton of time. This is your real time to shine and show prospective employers your real, hands-on experience in the industry. Whether you’ve had decades of experience over mechanical, industrial or commercial roles, or are just getting your feet on the ground, be sure to showcase your best wins first. Experience in electrical engineering can be valued in so many ways, so be sure to highlight where you’ve had success. Are you a pro in dealing with electrical failures? Have you designed emergency generator systems for big clients that have saved money? Highlight the company, your position and the dates involved. Then, without overloading too much describe your duties and achievements. Quantify stats wherever possible. Electrical Engineering Resume with no experience: If you’ve just entered the workforce or are fresh out of university, we recommend taking on some voluntary experience in the electrical engineering field to help build your initial experience. This will ensure you have the most professional entry-level resume sample possible. For more tips on writing your electrical engineering work experience, check out our detailed resume guide. It’s important to know that your experience in electrical engineering goes far beyond the classroom. While it’s really important to highlight your tertiary qualifications, it is also handy to list any training courses that you’ve undertaken - they will give you a leg up on the competition and also highlight your willingness to continue learning. Make sure they fit the job description, though. Make sure you that what you are telling your prospective employer is truthful. Even if you haven’t graduated yet, always let them know. You can indicate your willingness to improve your ‘professional practice’ - that’s a great way to say to avoid saying ‘education’ too much. In the digital era, recruiters and employers can just search for keywords in your electrical engineering resume. Not only is it really important to outline your engineering skills, it is also fundamental that they match the job description. Prove your skills and let them shine in your electrical engineering resume: don’t forget, soft ones relate to qualities and hard ones relate to real, tangible and specific skills in the field. Electrical Engineering Cover letter: Yes or no? Do you want a higher chance to convince your future employer that you are the one they are looking for? Check out our cover letter examples to get some real inspiration! Your resume looks great now, but if you are still even 1% unhappy, why don’t you let us inspire with our CV templates? Professionally designed to stand out from the crowd in the simplest way possible, our electrical engineering resume templates have helped many like you take their career to the next level!